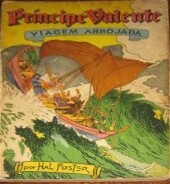 Principe Valente. Rio Grafica Editora (RGE). Brazil. Rio Grafica Editora (RGE). Brazil. El Principe Valente is the Portugese name for our hero. RIO GRÁFICA EDITORA, Rio de Janeiro, did publish the first real PV books in Brazil between 1950-1955. These were the famous reading books, with text adaptation by Max Trell and with illustrations from Foster. See also Hastings House publications from the US and the Badische Verlag from Germany. Compare book number 6 in all three series; all the same front covers, only the titles are changed. RGE did publish these books also in the fifthies of last century. It is to be thought that only 6 issues are printed, but in other countries they all print 7 books....These are expensive books, I guess 30 USD per book. RGE did also publish a serie of 28? magazines between Nov 1960 and the mid seventees. It was published initially bimonthly, then afterwards passed to monthly. Initially the publication was in two colors (black and red), from #21 it passed to black and white. Value is around 2,5 USD per issue. Also starting from #21 the cover design changed and the #21, 22,23 and 24 had a special note saying "Edition extra". Book #21 is something special, because there were actually 2 numbers 21. One in the old make-up and one in the new. I guess that customers who bought the old style 21 got the new style 21 for free, to let them become accustomed about the new design. There was one special edition with 64 pages. RGE did also publish one specil PV issue in their "Gibi Mensal" comic magazine. This 66 page edition is numbered 7, from november 1975. Value is around 3 USD. In their later "Novo (new) Gibi magazins they printed one special PV book. This magazine has the number 1796. Serie 1: Max Trell reading books. 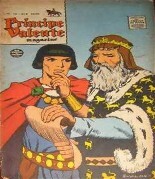 Serie 2: Principe Valente magazies. 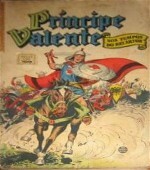 Serie 3: Principe Valente magazies; extra & special editions. Serie 4: Gibi Mensal magazines and specials.